Library for building applications for the HP100LX/200LX. The position argument may be: AN_LEFT or AN_RIGHT.
" Help Find Next Last "
" All Edit Add Quit "
Saves an image square to the memory. to a block of memory where the image will be saved. 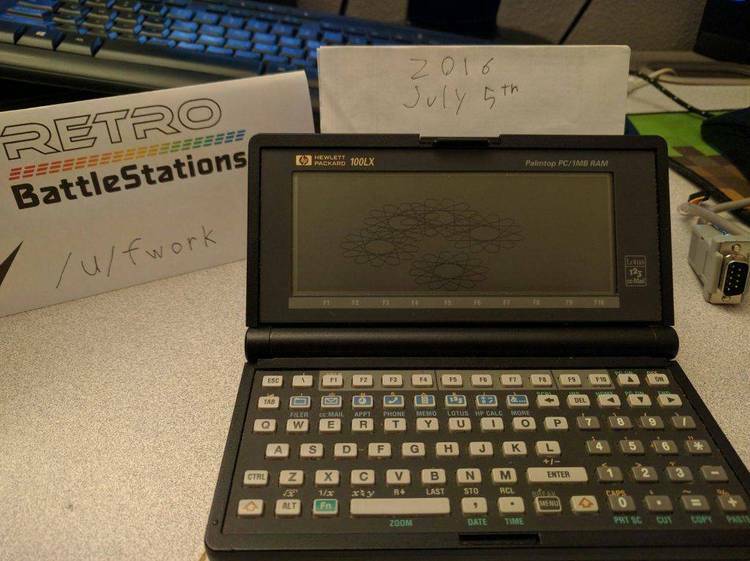 on the HP100LX palmtop' and then quit the program. Draws a line on the graphics screen. line by the to_horiz and to_vert arguments. 0x00 : Menu is not active (closed). 0xff : Menu is in navigation process. menu [1-10]. Only one menu can be opened at one time. items in the opened menu. function, to the position horiz,vert of the screen. other corner by the to_horiz and to_vert arguments. pixels in the defined area are reversed. the mnitem argument, in the menu bar. before using the sel_menu function. BLACK_COLOR for black (pixels on). WHITE_COLOR for white (pixels off). Sets the text font (size) for the text to be displayed. Sets the HP100LX in 640x200 BW graphics mode. may be an integer value between [0-65535]. Sets the HP100LX back to text 80x25 (CGA) mode. and the vert argument between [0-199]. right of the screen, and terminates program. of the display in reverse video. the open_win function for creating virtual windows.